9/24/2005 Over 1,400 Articles Posted! Nearly 100,000 People Downloading A Salvation Page Per Year! ---------- Inspiration For the Week-------The world is shaking and trembling as the powers of heaven, earth, and sea are shaken -- just as the Bible foretold. Did you catch the application to the current surge of hurricanes these past two years: "the sea and the waves roaring"? All Christians today must brutally examine themselves, to see if their hearts are truly right with Jesus Christ. ALL the signs of the End of the Age are coming to fruition now. We soon will either be in Heaven or a concentration camp. Spiritual preparation is the only preparation one can make. Then, reaching out to the lost is a major obligation for all of us. Even secular observers recognize that modern society is frighteningly adrift in a sea of rebelliousness and lawlessness. The cause of this condition is not the outward manifestations: violence, visible unrest, murder, hatred. The real cause is inward, spiritual. 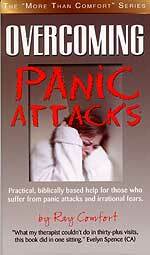 An inner struggle has raged within man since Adam's fall in the Garden of Eden, a constant resistance to control. 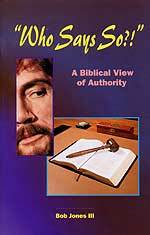 Dr. Bob Jones III, identifies the key issue as submission to authority. 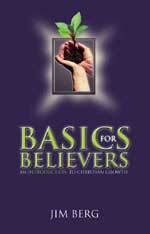 Beginning with the Biblical foundation of God's authority, Dr. Jones goes on to demonstrate how that authority extends to all areas of a believer's life. He candidly and powerfully utilizes a "down-to-earth" style to challenge Christians to return to a Biblical understanding -- and practice -- of God's authority structure. 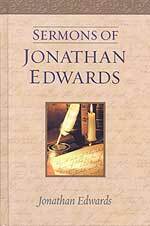 Echoes of “The Great Awakening” -- Jonathan Edwards is primarily remembered today as a gifted and influential theologian. But in eighteenth-century America, his preaching resounded from pulpits throughout New England, sparking the flame of revival that became the “Great Awakening.” As the fame of this Puritan pastor and preacher of revival spread far and wide, his sermons galvanized many of his listeners into reexamining their lives and faith. Ever alert to the dangers of the religiously complacent—those who only observed the surface requirements of religion—Edwards tirelessly proclaimed the overpowering majesty and grandeur of God, and humanity’s hopelessness for moral improvement short of his grace. This stirring selection of 20 messages allows readers to experience the words that swept through this young nation with a message of repentance and a call to action. Soul Winning At This Crucial Hour! Once a person is led to the Lord in Salvation, the most important resource you can place in their hands is the Bible! 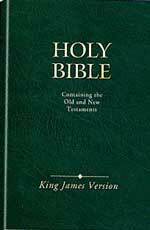 This KJV Bible includes a helpful yearlong Bible reading plan, plus a page explaining the Plan of Salvation through faith in Jesus Christ. Great value at only $1.99!! Simple and enduring instructional handbook of how to come to Christ, how to grow in Christ, and how to persevere in Christ. 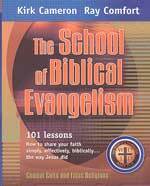 Perfect soul winning resource, for it contains not only the Plan of Salvation, but also excellent instructions on how to begin to personally grow in Biblical spiritual maturity. Not only will this aid you in winning a person to Jesus Christ, but will aid the new believer in growing in the Holy Spirit. 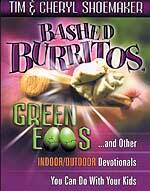 * "Bashed Burritos, Green Eggs ... And Other Indoor/Outdoor Devotionals You Can Have With Your Kids"
This collection of 12 indoor and 12 outdoor activity-based devotionals will breathe new life into your family and/or church devotional time. These devotionals address such child/teen issues as patience, pride, avoiding evil, based upon the various aspects of live as found in 1 Cor 13. 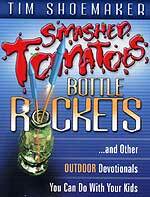 * "Smashed Tomatoes, Bottle Rockets & Other Outdoor Devotions You Can Do With Your Kids - Ages 8-12"
I. President Bush will fly to Colorado Springs, Colorado, to NORTHCOM -- North American Command -- headquarters after he returns from viewing hurricane preparations in the Houston area. Understanding that NORTHCOM is the headquarters from which nationwide martial law will be implemented and from which America will be turned into five Military Patrol Zones, is the time for the implementation of this plan within hours or days of occurring?
" US President George W. Bush, criticised for a slow federal response to Hurricane Katrina, will visit Texas tomorrow to get a first-hand look at emergency preparations for Hurricane Rita ... He did not say where in Texas Mr Bush would be going, saying the schedule was still in flux ... Mr Bush will also visit the US Northern Command, based at Peterson Air Force Base in Colorado Springs, Colorado. The Northern Command, created in 2002 to head the military's land, sea and air defence of the US, is headed by Navy Admiral Timothy Keating. "Mr Bush said last week the government and the US military need broader authority to help handle major domestic crises like hurricanes. 'This will give him a firsthand look at the Northern Command and how the military is assisting in federal government response efforts to Hurricane Rita', Mr McClellan said." The real story here is NOT that President Bush is going to Texas to view the preparations for Hurricane Rita, but that he is going to fly to NORTHCOM -- the Northern Command. Why is that so important? Because of Operation Ophelia! No, not the hurricane of that name, but the military operation called "Operation Ophelia". A Russian newsletter reported in early September that Hurricane Katrina had likely begun active preparations for the US military to implement Operation Ophelia. 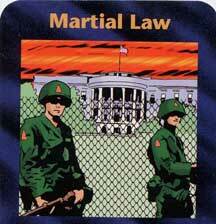 This operation, once begun, imposes nationwide Martial Law and divides the United States of America into five military patrol zones (Read NEWS1291 for full details). Foreign troops will patrol each of these zones, because they can be counted upon to be brutal to American citizens. Does President Bush's visit to NORTHCOM on Sunday have anything to do with implementing Operation Ophelia? Is the President just examining preparations to make sure they are on track, possibly awaiting the third disaster FEMA predicted, i.e., a major earthquake along the San Andreas Fault, or is the President going to force Martial Law upon this nation in the aftermath of Hurricane Rita? We cannot be sure, but we need to be very alert, aware, and prepared. Watch this hurricane tracking map at Hurricane Tracker. You will enjoy the easy-to-read moving graphics and you will be able to check the path of past storms. II. Hurricane Rita is striking Texas as we write this newsletter and she is swamping New Orleans. A. Let us address the New Orleans story first, because those patched-up levees just broke again, pouring water through, forcing the water to flood into low-lying areas waist deep, and rising three inches per minute! "NEW ORLEANS (AP) - Hurricane Rita's steady rains sent water pouring through breaches in a patched levee Friday, cascading into one of the city's lowest-lying neighborhoods in a devastating repeat of New Orleans' flooding nightmare. 'Our worst fears came true', said Maj. Barry Guidry of the Georgia National Guard. 'We have three significant breaches in the levy and the water is rising rapidly', he said. 'At daybreak I found substantial breaks and they've grown larger'." "Another concern is the storm surge accompanying Rita, which could send water rising as much as 4 feet above high tide ... As for those who refuse to leave, Gov. Kathleen Blanco advised: 'Perhaps they should write their Social Security numbers on their arms with indelible ink'." The Army Corps of Engineers advised yesterday that the levees could not withstand 6 inches of rain from Rita; as of this writing, 3-5 inches had already fallen. B. Hurricane Rita is bearing down upon Galveston - Texas City - Houston area as we write this newsletter. "Houston's perfect storm would feed on late summer's warm waters as it barreled northward across the Gulf of Mexico, slamming into the coast near Freeport. A landfall here would allow its powerful upper-right quadrant, where the waves move in the same direction as the storm, to overflow Galveston Bay. Within an hour or two, a storm surge, topping out at 20 feet or more, would flood the homes of 600,000 people in Harris County. The surge also would block the natural drainage of flooded inland bayous and streams for a day or more." "Coastal residents who ignored warnings to flee would have no hope of escape as waters swelled and winds roiled around their homes. Very likely, hundreds, perhaps even thousands, would die ... Meanwhile, as the storm moved over western Harris County, its most dangerous winds, well in excess of 120 mph even inland, would lash the Interstate 45 corridor, including Clear Lake, the Texas Medical Center and downtown. Many older buildings could not withstand such winds." "Unfortunately, we're looking at massive devastation," said Roy Dodson, president of the engineering firm Dodson & Associates, which Harris County asked to model realistic "worst-case scenarios" for a major hurricane hitting the area. Dodson's firm modeled more than 100 storms of varying power, speed and landfall. It concluded that a large Category 4 or Category 5 -- a storm only moderately larger than the four that struck Florida last summer -- would cause as much as $40 billion to $50 billion in damage. That's 10 times the cost of Tropical Storm Allison and approximately the city of Houston's entire budget for the next 15 years." "With sustained winds between 131 mph and 155 mph, the power of a Category 4 storm exceeds that of most building codes. Houston's commercial building rules call for structures to withstand three-second bursts of at least 110 mph..." (NOTE: Rita was still packing winds of 135mph, down from 170mph, but still well above building codes). For a country already reeling because of the loss of oil refining capacity hit by Hurricane Katrina, this hurricane could very well become the "worst-case" scenario. This region threatened by Rita contains 25% of the oil refinery capacity in the whole country; if the hurricane knocks out most of this capacity, the price of gas could easily hit $5.00 per gallon. In fact, this figure was mentioned in a very interesting place. A very dear friend of mine is an executive of a national trucking company. Late Thursday afternoon, this friend called me to tell me he had just come out of a meeting with the top executives of the company, a meeting held by a representative of the petroleum industry. After telling them that the price of gas is going to hit $5.00 a gallon very quickly, and after telling them that Rita could potentially devastate 25% of America's refining capacity, this petroleum representative said, "What we have to ask ourselves is 'how can the trucking company survive $5 a gallon gasoline'?" Let us now return to this featured article to see how Houston and that area could be absolutely devastated. "More devastation would be caused by winds blowing over the Gulf of Mexico and pushing surface water inland -- creating up to a 20-foot storm surge. Such a wall of water would swamp most development near Galveston Bay, including Texas City, Kemah and Johnson Space Center. Varying levels of water would flood much of the area between Sam Houston Parkway and the bay. On Galveston Island, the seawall could hold back much of the storm surge, but at some point the water would creep onto the island from the bay side. The island's highest point is just 22 feet above sea level. Much like a river becomes deeper and more turbulent when it narrows, a storm surge also can increase in height and intensity when its source of water narrows. Dodson said this has profound implications for the Port of Houston. Some models ended with a 30-foot wall of water in the Ship Channel near the port's turning basin, he said. "It would be huge," he said. "It could overwhelm chemical storage facilities, water treatment plants and other sensitive areas." But, the biggest concern are 100-foot waves that occur only once every 300 years! Since Hurricane Rita is said to be one of the strongest ever in the Gulf, it is conceivable she could be packing these 100-foot waves. C. Residents of Southwest Louisiana pack up to flee Rita, expecting to find nothing left when they return. "HOLLY BEACH -- Without warning, the breeze off the Gulf of Mexico stiffened. The normally gentle surf rolled in on six to nine-foot waves as monster Hurricane Rita churned offshore ... 'We're banking on coming back to nothing', said Ricky Romero, standing on his deck, a golf shot from the water, 'or not coming back at all'." Earlier this week, we posted an article stating that many Floridians on the Keys were now so sick and tired of having to continuously evacuate, they are beginning to pack up and leave for good. This change in attitude is surprising, since these were the "Party Animals" who would stay during a hurricane, throwing the biggest party possible. More and more people in key areas being constantly pounded by hurricanes are reaching this conclusion. And, why should we be surprised, for these coastal areas are predominantly the Red United Nations Biosphere areas, destined to be "Re-wilded", or they are the Yellow areas, where human activity will be severely restricted. "Even though Rita was probably 48 hours away from landfall, no one in this hamlet of ramshackle fishing camps and weather-worn beach houses wanted to chance anything. A mass exodus was well under way ... Projections had Rita landing in Galveston, Texas, more than 100 miles west. But that moved east with every weather update. The storm's course change could send it away from Houston and Galveston and instead draw the hurricane toward Port Arthur, Texas, or Lake Charles at least 60 miles up the coast, by late today or early Saturday. But it was still an extremely dangerous storm -- and one aimed at a section of coastline with the nation's biggest concentration of oil refineries. III. USA Today reported in May that a very dangerous Bio-4 Defense Laboratory was located in Galveston, Texas! Hurricane Rita is bearing down on a lab containing some of the most virulent, most dangerous bacteriological and virological specimens on earth -- specimens designed to kill an enemy by the millions in some future war! "In the aftermath of the terrorist and anthrax attacks in 2001, biodefense laboratories are springing up across the country. Critics worry that the lack of adequate safeguards could make these labs a danger to public safety, particularly in urban areas, if deadly materials escape. The most dangerous of these pathogens are in biosafety-4 labs. "Classifications: 1) Biosafety-4: The most secure. Labs deal with life-threatening diseases that may travel by air and for which there is no treatment, like Ebola. 2) Biosafety-3: Handle airborne life-threatening diseases for which there is a treatment, like anthrax. 3) Biosafety-2: Found in a typical hospital. Labs handle diseases with a low risk of transmission. 4) Biosafety-1: Handle germs that do not cause disease. 5) Biodefense aerosol: Handle aerosolized pathogens." Now that you know the various categories of Bio-Defense laboratories, let us continue with this story to see which level facility exists at Galveston -- a city prone to storm surge, according to the article, above. "Operational BSL-4 facilities ... Univ. of Texas Medical Branch, Galveston and Southwest Fdtn for Biomed. Res., San Antonio"
Thus does Texas contain two of the most dangerous Bio-Shere locations - at Galveston and San Antonio. While Galveston may be directly hit by Hurricane Rita, San Antonio seems safe, at least at this time. However, it is extremely dangerous to have such a Bio-Defense laboratory sitting right where a massive hurricane can take it out. Fears of Galveston flooding are not unfounded, as this video prepared just several weeks ago for Galveston planners indicates. "A computer simulation shows the devastation that could happen in Galveston, Texas, if Hurricane Rita hit there. Rita became a Category 4 storm on Wednesday morning. With Galveston located near sea level, there's growing concern that Rita's rain and storm surge could cause widespread flooding. 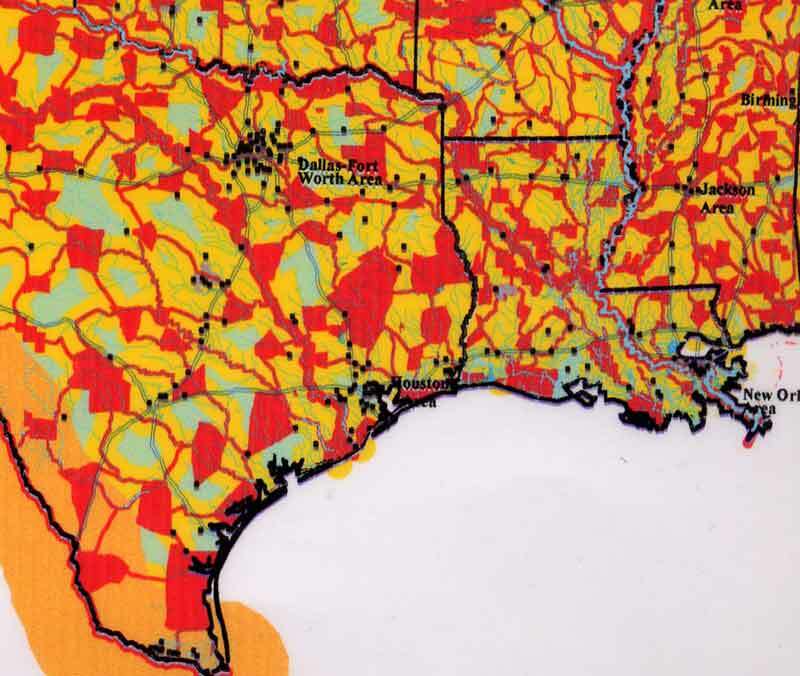 Using high-resolution topographic maps and data gathered from Hurricane Carla in 1961, a University of Texas researcher simulated the effects of a Category 4 storm on the Galveston area. The result is a smaller-scale version of what happened in New Orleans following Hurricane Katrina. Huge areas completely submerged, destroying billions of dollars in property and taking countless lives. "The simulation was put together for the city of Galveston earlier this month." Please note the hotlink upon which you can click to view this actual computer simulation of what Galveston may look like if Rita hits as feared. Let us hope and pray that these extremely dangerous pathogens can be removed before Rita hits and any infected animals dealt with so their carcasses do not spill into the water, to decompose and release the active agent. IV. As if the price of oil and gas are not high enough -- now tracking around $69 per barrel -- President Chavez of Venezuela is again threatening severe retaliation if the United States attacks his country. Remember, Venezuela is a Non-Integrating State and is ripe for a "Regime Change".
" The President of Venezuela Hugo Chavez Frias said recently that world oil prices would surge to $200 dollars a barrel if the United States attacks his country ... In a CNN interview Chavez said 'if they attack us with their battleships, with waves of intelligence officers, bombs, marines and all of that, well, you can forget about oil'. Chavez, has charged the United States with drafting a plan to attack Venezuela but he says that any such invasion would leave Venezuela and the Americans without oil.
" 'The barrel could reach $200 from one day to the other ... the US government can forget about the 1.5 million barrels of oil that we send every day and which contributes enough to its development'." Is it possible for President Bush to order an attack on Venezuela? Yes, it is possible, even if the United States is bogged down in Iraq and reeling from natural disasters at home. Chavez undoubtedly knows the Illuminati considers Venezuela a "Non-Integrating State" (NEWS1833). Chavez fears Venezuela is next. Listen as this concept as to why America is invading or threatening to invade or attack, nations considered to be "Non-Integrating". Isn't that incredible? When we contemplate invading a country -- Iraq and Afghanistan -- The Pentagon considers that we have taken "real ownership of strategic security" over that nation! You can forget all the rhetorical hogwash about "spreading democracy", for our real aim is to take "real ownership of strategic security". Can you see why Venezuela's President Chavez is so adamantly opposed to his designation as a "Non-Integrating Nation". Such a designation might very well mean that American warships and Marines are parked offshore, about to attack! If you think Chavez is being unreasonably paranoid, listen to the next arrogant statement from this "Pentagon's New Map", book. Certain newsletters are currently trumpeting that American warships are, indeed, parked off the shore of Venezuela, and that a big American military base in Paraguay is ready to go operational. 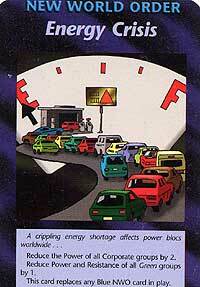 If crude oil were to jump to $200 a barrel, every Capitalist country in the world will suffer economic collapse. But, of course, that is the Plan -- once the world is safely on its way to the planned Third World War. 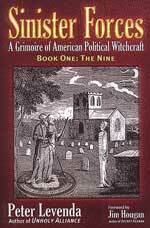 Remember, the revelation from former Satanist, Doc Marquis, that the Illuminati was determined to keep Americans feeling prosperous, right up to the time of the beginning of World War III. In other words, the economy would be kept afloat until that world war was about to begin. Thus, the very fact we are seeing events taking Capitalist countries to the brink of disaster should tell you that the beginning of that global war must be close at hand. V. Speaking of oil prices taking America to the brink of disaster, let us review what activities Iran is taking now, for any confrontation with America would likely close the Strait of Hormuz. Since so much of the world's crude oil passes through that strait, oil prices will immediately skyrocket with any hint of war between Iran and America. Recently, we have noted that Iran is expressing no fear of the United States, but, rather, a tone of defiance. We posted an article last week entitled, "Iran's Leadership Threatens The United States With Devastation, Saying They Learned Valuable Lessons From The Government's Response To Katrina" (NEWS2074). In this article, we reported that Iran felt the United States was extremely vulnerable and could be attacked in all 50 of its states. This week, we see that Iran is taking steps which a country would take only if it planned to go to war. "Incredible though it may sound, there are signs that Tehran may be preparing for a military confrontation with the United States and has convinced itself that it could win." This article then lists the concrete steps toward a war with the US which the Iranian leadership is taking. 2. Carried out a little publicized purge of the military, the security, the civil service, state-owned corporations and media. The most significant purges have affected the military high command. 3. Among those replaced are the defence minister, the commander-in-chief of the regular army and his four deputies, 11 senior commanders of the Islamic Revolutionary Guard Corps (IRGC) and five commanders of the paramilitary. 5. Another sign that Tehran may be preparing for war is the appointment of military officers to posts normally held by civilians, such as governors, mayors and directors of major public corporations. 6. But, perhaps, the surest sign yet of war is the military build-up under way in the five provinces bordering Iraq. The region, with a population of 20 million, has been put under the control of the IRGC. Iran is estimated to have 250,000 troops in the area, its biggest military build-up since the end of the Iran-Iraq war in 1988. 7. The new, hardliner Cabinet then approved an "emergency" fund of $700 million (Dh2.57 billion) to be disbursed at the discretion of "the supreme guide" for "sacred defence purposes". 9. In the past few weeks top regime figures, including Khamenei and Ahmadinejad, have made a series of unscheduled visits to Mash'had, Iran's second largest city. One curious fact revealed during these visits is that a bunker-like structure to house the 'supreme guide' is being completed close to the holy shrine of Reza, the Eighth Imam. These do seem to be war signs, but the idea that Iran could possibly be preparing for a war against the United States seems to be unrealistic, at best. However, I do see a couple of scenarios by which Iran might go to war against American forces. * If America were dramatically weakened. As we prepare to deal with the destructive effects of Hurricane Rita and the price tag associated with the loss of oil refining capacity, and if we are further devastated by an earthquake along the San Andreas Fault, I could foresee that our enemies across the seas could believe that we are too weak to carry out an all-out war so far from our homeland. * Along this line of thinking, Arabs have always hesitated to attack Israel because of her superpower backer -- the United States. In 2002, President Bush put a nuclear hedge of protection around Israel (NEWS1628). If the US is severely damaged by Hurricane Rita, and if FEMA's third deadly disaster devastates Los Angeles and/or San Francisco, Arabs hungry to destroy Israel might conclude that America could no longer rush to Israel's aid. Since Israel has already weakened herself internally by unilaterally withdrawing from the West Bank, the Arabs might conclude that the convergence of these two events has changed the balance of power so dramatically that they just might attack Israel. If this is the case, the beginning of World War III might be closer than you think. * If Iran felt so comfortable with her Russian and Chinese backing and massive military support that she no longer feared the United States. * Iran has observed the foolish tactics employed by the American forces in Iraq now for over two years. Perhaps she has concluded that American leadership is so inept that Iranian forces could defeat the United States in pitched battle. VI. The Foreign Minister of Saudi Arabia shockingly accused Washington of "handing Iraq over to Iran"! How can this be? And, why would such comments flow from one of our most trusted allies? 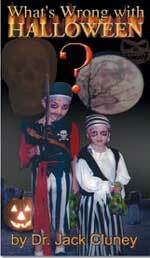 Further, notice that this complaint was made directly to the Council on Foreign Relations!
" New York: US policy in Iraq is widening sectarian divisions to the point of effectively handing the country to Iran, Saudi Arabian Foreign Minister Saud Al Faisal said on Tuesday. '[Iraq's] people have been separated from each other', Saud told the Council of Foreign Relations in New York. 'You talk now about Sunnis as if they were separate entity from the Shiite'.He urged the United States to work 'to bring these people together'. Saudi Arabia has voiced fears that an Iraqi constitution could split the country apart and disenfranchise a Sunni minority that lost power when a US-led invasion ousted Saddam Hussain in 2003. 'If you allow civil war, Iraq is finished forever', Saud said." Perhaps the venerable Saudi Foreign Minister should carefully read "The Pentagon's New Map", which we discussed earlier, above. Part of this grand Pentagon strategy is to overthrow countries whose leader is strongly dictatorial, and then act to split that country into sections so it could never be a unified whole again. According to this new Pentagon thinking, a divided country could be brought into compliance with the global Illuminati far more quickly than a unified country under the leadership of one dictator. Since this is part of the overall strategy of American policy, I would think that our war in Iraq has to be considered a smashing success! The closer Iraq edges toward civil war, the more successful our hidden global strategy is working out in that country. The Saudi Foreign Minister then warned that our strategy of dividing Iraq is actually playing into the hands of the Iranians. Now, can you see why Iran is feeling so strong these days? VII. Secretly operating British Special Forces soldiers were caught in Basra this week dressing and posing as insurgents as they shot at, and killed, some Iraqi civilians -- all to blame the carnage on the insurgency. Shi'ite militia captured the two undercover British soldiers, Britain mounted a heavy-handed raid to free them, and the city of Basra is boiling over so much that British troops have withdrawn to the outskirts of the city. On several occasions, Cutting Edge has warned that American and British elite troops were responsible for some of the "internal violence" within Iraq. Some of our Special Forces snipers were actually killing civilians so the insurgency could be blamed. However, this incident is the first in which such soldiers were actually caught carrying out their dirty "government provocateur" operations! There have been a number of incidents in this area and throughout Iraq in which police and civilians have been targeted and killed by "terrorists" or "insurgents". But this is the first time that any of those responsible have been caught in the act, and it is now clear that at least some of them are working directly for the occupying forces, as many Iraqis have openly suspected all along." Once the news got out about this incident, the civilian population in Basra nearly exploded in anger. Even though many people suspected that Coalition Forces were dressing as Arabs in order to shoot and kill people, thus moving the country closer to civil war. Yet, nothing had ever been proven -- until now. As anger was building among the civilian population in Basra, the British military moved quickly and decisively to rescue their special forces men before the Iraqi insurgency could seize control of the men and hold them up as examples as to why every Iraqi should close ranks to throw the Coalition Forces out! The raid successfully rescued the men, but it prompted even more anger amongst the people. "British soldiers have described how they bailed out of a burning tank after it was attacked by a mob throwing bricks, stones and petrol bombs in the southern Iraqi city of Basra. The soldiers were caught in a riot on Monday during a British raid on an Iraqi jail to free two undercover soldiers detained by local security forces. The raid provoked a furious response from Iraqis in Basra, and Iraq's government has launched an investigation. During the raid, a crowd of Iraqis hurled petrol bombs at British troops, and pictures of one soldier engulfed in flames as he tumbled from his tank have dominated British television and newspapers for days ... British forces eventually completed the raid, breached the walls of the jail and freed the two undercover soldiers. "The incident has heightened tensions between Iraqis and the 8500 British troops based in the south of the country." How much tension was generated by this unbelievable raid? "BAGHDAD (AP) - British troops in the tense southern city of Basra greatly reduced their presence in the streets Thursday, apparently responding to a provincial governor's call to sever co-operation until London apologized for storming a police station to free two of its soldiers. In an interview with Associated Press Television News in Baghdad on Thursday, Iraqi National Security Adviser Mowaffak al-Rubaie called Monday's attack by British forces on a Basra police station "a flagrant violation of Iraqi sovereignty." Even the Iraqi provisional government complained and vowed not to cooperate with Coalition Forces until and unless they get an apology from the British government; while they are at it, they might as well demand an apology from the United States for the same thing, for we have seen numerous reports that American forces have been carrying out this classic type of "government provocateur" operation. * "F.E.M.A. -- WANTED FOR MURDER IN NEW ORLEANS" -- Chronicled In This Article: How the United States Government created such an horrific destruction of an American city and its population so it could seize control. ---------Conclusion----------------"Safety in the Secret Place of the Most High God"
HE WHO dwells in the secret place of the Most High shall remain stable and fixed under the shadow of the Almighty, Whose power no foe can withstand. I will say of the Lord, He is my Refuge and my Fortress, my God; on Him I lean and rely, and in Him I confidently trust! For then He will deliver you from the snare of the fowler and from the deadly pestilence. Then He will cover you with His pinions, and under His wings shall you trust and find refuge; His truth and His faithfulness are a shield and a buckler. Only a spectator shall you be, yourself inaccessible in the secret place of the Most High as you witness the reward of the wicked. Because he has set his love upon Me, therefore will I deliver him; I will set him on high, because he knows and understands My name -- has a personal knowledge of My mercy, love, and kindness--trusts and relies on Me, knowing I will never forsake him, no, never. Our only protection during times like this is to plead the protection of our Almighty and loving Saviour, Jesus Christ. "There is power in the blood of Jesus"